Bingo Game Terms is the second part of the bingo glossary and includes links to the amusing sounds and rhymes of the UK Bingo Lingo for numbers 1-90 and Online Bingo Report. For now, we will continue this glossary starting with the letter H followed by a bonus quiz question. High 5 Gala Bingo: UK bingo game connected to all bingo clubs and played at the same time. Example of prize money split is £1000 for a line, £2000 for two lines and £3000 for a full card. An additional feature is where the number 5 comes in. If the winner yells Bingo on any number ending in 5, then a £25000 payday awaits instead of £3000 for a full card. .
House: refers to the venue, be it a casino property, bingo hall, large tent or online website where bingo is played. As with casinos, the owners/operators of bingo venues are also known as the House. Additionally, UK Bingo Win. See Call House. Inlaid Card: printed bingo cards, often in 4x4 format placed into a table. Black discs mark the numbers when called. Jackpot: prize awarded for particular bingo games or pattern wins. Late Night Bingo/Moonlight Bingo: term for bingo sessions that begin after 10pm. Lucky Stars: UK Windfall Lucky Star game is played where each player is assigned a number from 1 to 90 -known as their Lucky Star. If the last number called before bingo is the player’s Lucky Star, the payout is increased by up to £2000. Main Stage Bingo: describes the top jackpot or event that brings in bingo players. Usually, the ever-growing progressive jackpot amount will be front and center as the Main Stage. Mini Bingo: see Speed or Quickie Bingo. Minimum Buy-in: the least dollar amount required to be eligible for prizes. Money Ball: a number drawn before the game that doubles your winnings if a bingo is called on that number. Multiple Winners: when more than 2 players win, the prize is divided equally among them. On: jargon used to declare that a player is On with one or more cards that require only one number for a win. On The Way: bingo played before the coverall game, usually a progressive. Generally won for an X or top/bottom lines within a few numbers and for a smaller payout. The coverall or blackout game then proceeds after this small winner is declared with all players using the same card until the top jackpot is won. Online Bingo: presents a mix of a wide selection of games, promotions, loyalty rewards membership, themes along with social networking with fellow players. Be prepared for a unique bingo experience played in your PJ’s. Parti: abbreviation for participation bingo where the cash prize is determined by the number of players.Generally inlaid cards and hand-held shutter boards are used for parti where the cash prize is at least 50% of monies received for each bingo game. Pattern Bingo: a specified pattern on the bingo card. Ex:=letters X, T or H. See Bingo Card Variations for details. Payout: based on percentage of sales (about 75%) paid out by the bingo hall. Postage Stamp Pattern: bingo won by called numbers matching a 2 x 2 grid in any of the four corners of the card. See Bingo Game Variations. Progressive Jackpot Bingo: grows until it is won and requires a separate buy-in. These bingo games start with 45 numbers drawn per session and go up one number per week until won. Generally, the first game played per bingo session. Rainbow Pack: assorted package of paper bingo cards that are played for various prize amounts. Blue cards are the least expensive, then red, green and tan pays the top bucks. Session: bingo program that include regular and special games lasting approximately 2-3 hours. Shutter Board: plastic game card with printed numbers marked by closing shutters. Six-pack, Nine-pack: lingo for 6 or 9 numbers in a block on one bingo card. Special Games: generally requires an additional fee to purchase these cards. Speed or Quickie Bingo Game: played with 30 numbered balls (1-30) only. Split Pot: term for a payout for winning is split between the winner(s) and the bingo operator based on the sale of bingo cards for that particular game. Split Pot could consist of 1/3 to the House and 2/3 to the winner(s). Squares: refers to pattern wins. Outside square: utilizes B and O row plus top and bottom rows across. Inside square: is a win around the free space utilizing I, N and G rows. Table Board Bingo Game: described as a lottery format where players try to complete particular patterns of numbers first using the device via numbers selected at random. are wild and should be marked as covered or called. On the other hand, if B11 is called then all odd numbers are wild. Once determined and numbers marked, the game moves on for the blackout win and a loud Bingo! Throwaways: Another term for Flimsy/Flimsies. Tickets: for the printed pages designated for main stage bingo play. Printed in grids and distributed as books, these tickets are typically assigned bar codes used to assist with win validations. Validation: after a called bingo, to determine players' eligibility for the jackpot award. Wild Number: can be played for a double bingo. This is determined by the first number out. For example, the first number is G47; therefore, all numbers ending in 7 will qualify as a wild number and should be marked. Windfall Bingo Games: specialty games offered at land-based clubs and online where prize money is increased. These games are part of a regular bingo session and are offered free or at an additional fee. Examples are Bingo Bonus and Double Bubble. Wrap Up: last bingo game for that session. WOB: Wild on Bingo says it all to end this bingo game terms list. What is a Hard Card in Bingo? B. A bingo card made of sturdy cardboard. Click here for the answer and more Bingo Quiz Q&A. 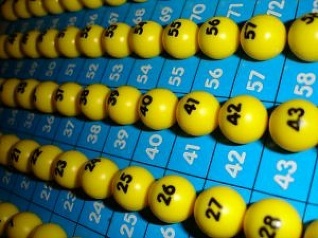 The most popular online bingo games are the 90-Ball versions played on a 9X3 card equal to 9 columns and 3 horizontal. Total of 15 numbers per card while the rest are free spaces. The first column numbers are 1-9 to last column=80-90. This version is played regularly in the UK. Also parts of Europe, Australia and South America.